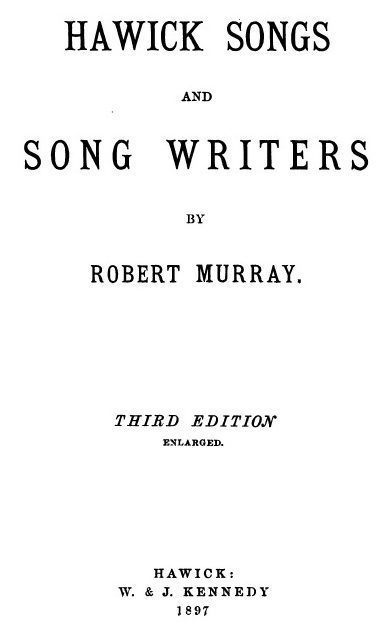 The completion of a line of Railway, to which the metropolis of Scotland and the ancient burgh of Hawick have become respective termini, with certain advantage to the latter, if not indeed to both places,—appeared to the compiler a suitable opportunity for stringing together such notes connected with the history of the town, as he had from time to time entered upon his tablets. Inconsiderate observers may feel disposed to undervalue these " short and simple annals but when it is remembered how completely neglected the topography of our country has been, and how important are the smallest materials which contribute to remedy the defect, the facts hereinafter recorded may appear to be neither uninteresting nor entirely devoid of historical value. 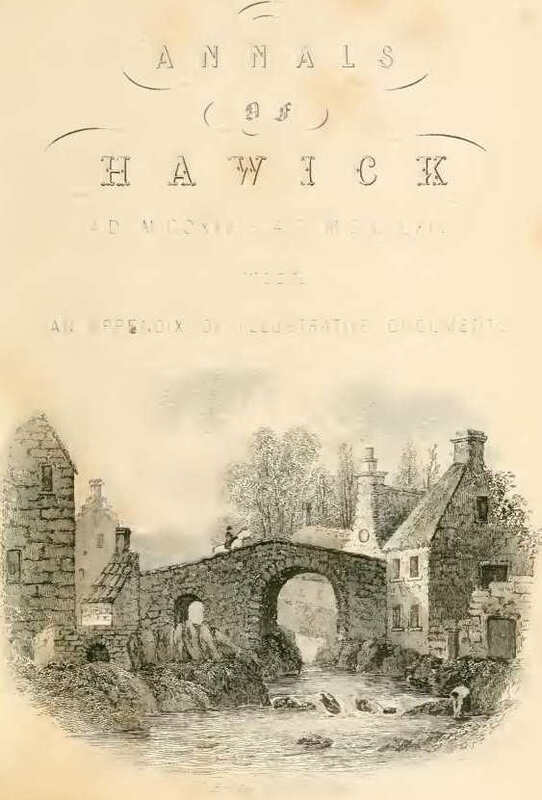 To some individuals, the Record of the Proceedings of the Circuit Court of Justiciary, held at Dumfries and Jedburgh in the years 1622 and 1623, contained in the Supplement, may seem to have no special connection with the town of Hawick; yet it certainly sheds light on the state of society throughout that part of the Borders with which the town is usually identified, during a period when history furnishes but scanty materials for reference; and a collection can hardly be considered altogether insignificant, containing authentic reports of our ancient mode of procedure in trials for crime on the Borders, of a much earlier date than any of a similar character yet discovered. 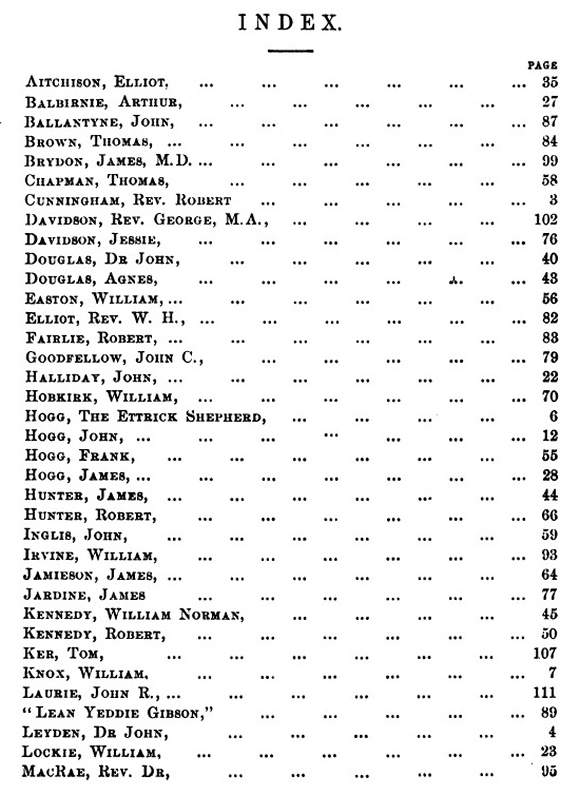 The Appendix includes several documents hitherto unpublished, calculated to convey to the reader an accurate notion of the municipal constitution of the burgh ; and, with regard to the Biographical Sketches, although the lives of some of the persons may be found elsewhere, these, for the most part, are contained in books not generally accessible to most readers. The View of Hawick, from a painting by Mi-Andrew Richardson of Edinburgh, is taken from Easter Martin's Hill, a point which is considered to afford the most pleasing representation of the locality. The Vignette is from a painting, apparently that executed by L. Clennel for Sir Walter Scott's Border Antiquities of England and Scotland, published in 1813. To Alexander M'Donald, Esq., Keeper of the Register of Deeds in the General Register House, Edinburgh, who, by revising with remarkable care, the proof sheets of the Justiciary Record, relieved the Editor from that irksome task, his thanks are justly due, and gratefully tendered. Had access to the archives contained in the charter-rooms of the feudal mansions connected with this part of the Southern Border been obtained by the compiler, the following pages might have been rendered more complete and interesting. As it is, he can only express a hope that some future and more competent individual may enjoy that fortunate privilege. "James Douglas of Drumlanrig, 1537. Quarterly first and fourth, three mullets; second and third, a mans heart; and on a chief, three crosses pattee. Appended to a Charter by James Douglas of Drumlanrig to the town of Hawick, 11th October 1537. Counter Seal of the last. Seal of the Burgh of Hawick, circa 1814. "The Commissionaris Court Buik of the Sherifdomes of Bervick, Selkirk, Peiblis, Jedbrugh, Dumfreis, and stewartries of klrkcudbrycht and Annandaill, quhairintill Gilbert Watt, notar, is clerk, begunne the xxi of Maij 1622, at Dumfreis. (8.S.) Gilb. Watt, Clk." XIII. Rev. Thomas Somerville, D.D. XVI. Rev. Samuel Charters, D.D. XVIII. Rev. John Young, D.D. Addendum.—Rev. George Hepburn and the Rev. Thomas Somerville. Bibliography of Works relating to, or published in, Hawick with an Appendix containing a List of Hawick Newspapers, Local Maps, and Music by James Sinton (1908).